Saturday, March 14th through April 4th, 2015. 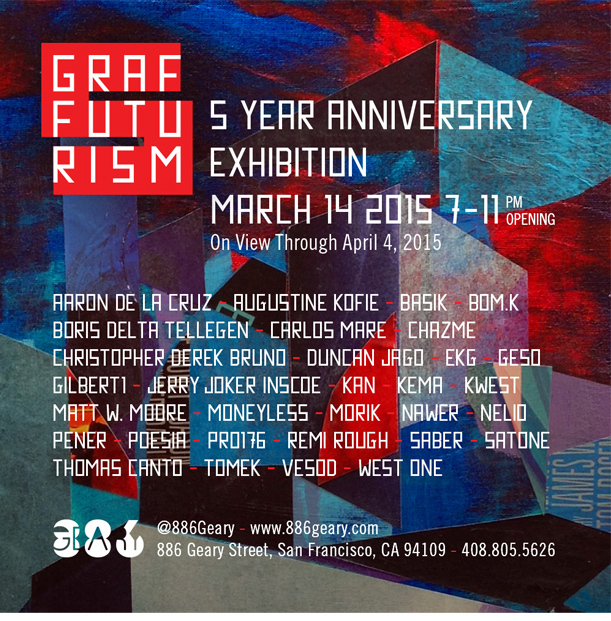 886 Geary Gallery will celebrate Graffuturism’s 5 Year Anniversary with an international exhibition opening March 14th. Graffuturism has exhibited as a group over the past 5 years in cities such as Glasgow, London, Los Angeles, Paris, Miami and San Francisco. 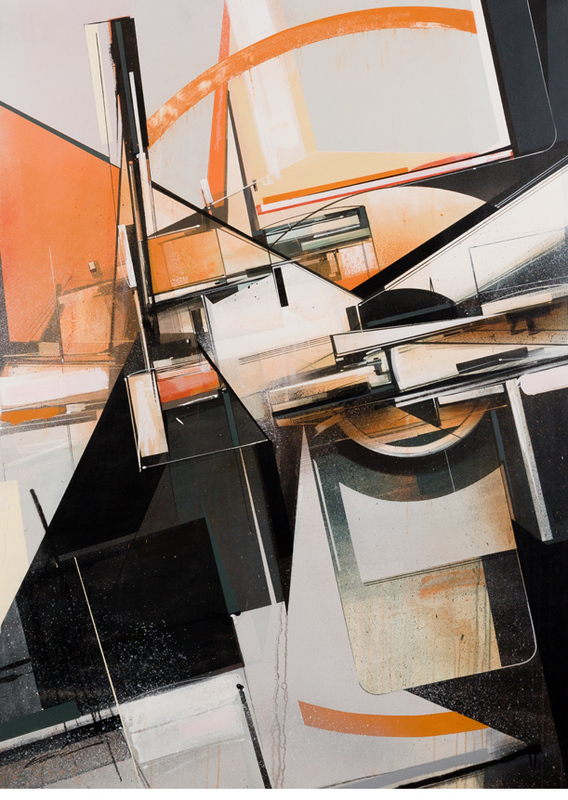 Graffuturism has chosen 886 Geary to hold its anniversary show bringing together an impressive group of International artists to exhibit. Poesia has curated a lineup of premier Urban/Graffiti Art artist who have been pivotal in the development of Graffuturism the past 5 years, or who have been closely associated with the group. Remi Rough, Saber, SatOne,Thomas Canto, Tomek, Vesod, and West One. Graffiti/Urban Art has flourished and established itself in the contemporary art scene over the past decade, yet it remains a relatively new art form in the historical sense. In 2010 Graffuturism started a blog that set out to showcase the work of fellow Graffiti/Urban Artists who were underrepresented. There was a gap in how the media had been covering the art form: one side being about the new street art, and the other about traditional graffiti coverage. There was no middle ground or coverage of graffiti artists who had pushed forward to explore progressive hybrid directions, or about the newer street artists who worked more like graffiti artists. This is where Graffuturism started and established itself as an alternative to what was taking place in the Graffiti/Urban Art media. Expectantly the blog would strike a chord with fellow artists from around the world, and would go on to establish one of the most organized international group of artists within the larger Graffiti/Urban Art scene. Graffuturism is composed of an emerging progressive global art form that in its natural environment on urban streets around the world has far surpassed any recent contemporary art form. While other art movements or groupings may have taken place due to common theory, ideas, schools, or location, Graffuturism has utilized social media and the Internet to connect and assemble through a common interest in this new progressive Graffiti/Urban Art. What started out as a blog has now become something larger. The term might imply a movement by utilizing the ism in its name, and also reference Futurism within its title, but it had no intention of either being an art movement in the modernist sense of the word nor is it based on futurist principles. This doesn’t mean that Graffuturism does not share certain characteristics of an art movement or deny the fact that some of the artists reference futurism aesthetically in their work. Graffuturism is just another word. The real power of our art form is in our actions as artists collectively. We don’t set out to define where we stand in today’s lexicon of art terms, instead we offer proof of our existence with our work. Our art form was born out of the need to express ourselves through art and aesthetics in the urban streets. With this grouping of artists for this Exhibition we set out to showcase a group of artists that have been part of Graffuturism over the past 5 years in some form, and bring together a wide range of aesthetics that exemplify the essence of this Othercontemporary movement Graffuturism, and also to explore where this movement is heading. Through Graffuturism we have found a base to have this conversation amongst each other as International Peers. We move forward with or without the acceptance of academia, engaging the world the only way we know how – through our work in the streets and in the studio. The latter engages an older system of art with a structure much different than the art we create on the streets for the public and ourselves. Without the context of our street work, our studio work would seem impure, dishonest, out of place and out of context. foot space is one of the largest galleries on the west coast. emerging artists to San Francisco. 886 Geary is the curator’s newest project and venture into the commercial gallery space. Poesia will continue to bring artists from around the world to San Francisco and establish 886 Geary Gallery as the premiere destination of urban and contemporary art in the SanFrancisco Bay Area.